Denmark established its postal services in December 1624 under King Christian the Fourth, that operated by the usage of nine main routes maintained by the mayor of Copenhagen and several guilds. The mail was carried by foot but, by 1640, riders were employed. In July 1653, the service was privatised and innovations such as mail coaches for carrying parcels and service to Norway were introduced. In March 1985, the service was handed over to Count Gyldenlove (son of King Christian the Fifth) and was controlled until 1711 when it was reclaimed by the State. By early 1800s, steamships were employed for carrying the mail to other places too (Copenhagen to Kiel). The first postage stamps were introduced in April 1851 with imperforated, typegraphed and watermarked stamps. The design adopted the crown, sword and sceptre in the centre. The denomination was in rigsbankskilling and the local postage rate in the capitral was 2 rbs and for the national rate, 4 rbs. Ferslew made the design and first printings but following his death, Thiele took over the task of printing these stamps. The currency change to skilling and rigsdaler in 1854 forced the design of new stamps adpoted from the previous design, with new denominations. At various times, values of 2s, 4s, 8s and 16 s were issued until 1857. In the following year, the stamps changed their dotted-pattern background to the wavy-line style. In 1863, the watermark used a larger crown and the stamps were rouletted. As far as the cancellations are concerned, the numeral style was adopted (a number with concentric circles). The number 1 was used for Copenhagen, the number 2 for the office in Hamburg and so on. stamps of Denmark to be perforated. 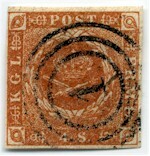 By 1870, the postal authorities worked on and released an issus of postage stamps with centrally-positioned large numerals within an oval design that was surrounded by an ornate frame in a different colour. 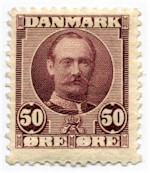 In 1904, King Christian the Ninth became the first king of Denmark and was depicted on a stamp. A year later, a new style of numeral design appeared and used the three wavy lines on each side representing the three waters separating the largest Danish islands. With King Frederick’s (The Eighth) accession to the throne in 1907, the earlier royal design was updated. In 1912, we observe the surcharge of 35 ore on some stamps and the appearance of the country’s first pictorial postage stamp of 5 kroner depicting the Copenhagen GPO. King Christian the Tenth appeared on postage stamps between 1913 and 1928. In 1918, the lack of a 27 ore stamp resulted in surcharges on newspaper stamps which are scarce today. Commemorative stamps appeared in 1920 and 1924 with the corresponding issue of 3 pictorial stamps on the reunion of northern Schleswig with Denmark, and the 300th anniversary of the postal service. In 1927, the postal authorities issued a set of 6 stamps depicting a caravel. These stamps usend different printing methods and some design variations exist. During World War II, the country was occupied by Germany but the there was no effect on the design of postage stamps. After the war new designs were explored and the ‘three lions of the state seal’ appeared and were used well into the 1990s. 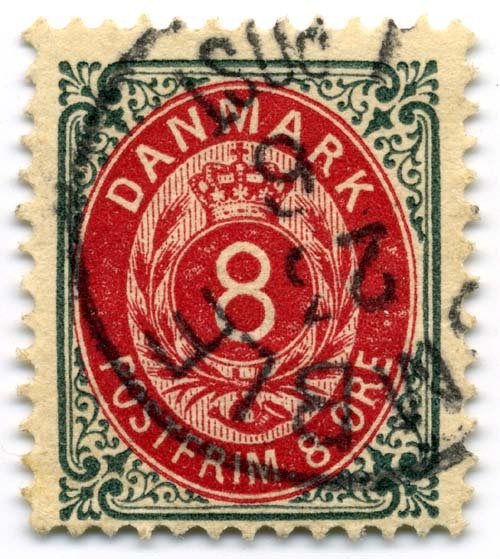 The modern stamps of Denmark are of high quality and while the engraving process has been extensively used, some productions used lithography. Examples are the stamps of Margrethe and the 'wavy lines', issued in 1983.